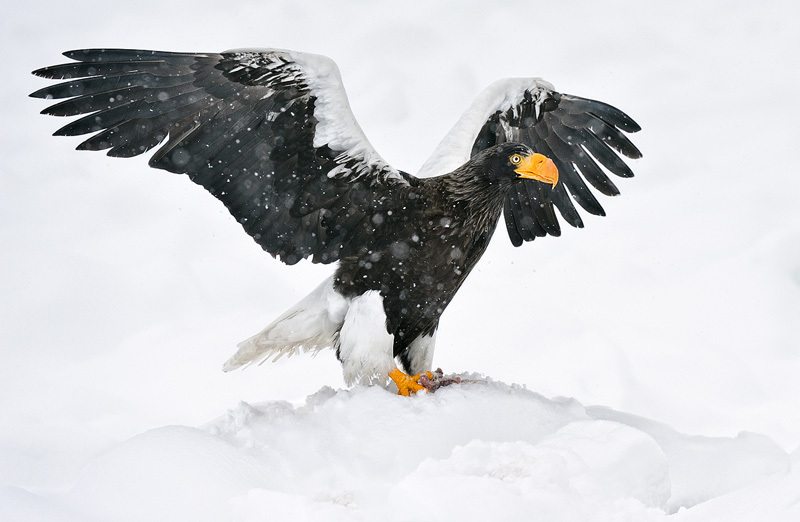 The Steller's Sea Eagle (Haliaeetus pelagic us) is a large eagle that lives in coastal northeastern Asia and mainly preys on fish and water birds. It is the heaviest eagle in the world, at about 5 to 9 kilograms, and one of the largest raptors overall. The wingspan is from 1.95 to 2.5 meters, an impressive sight as you can see in this image. Late winter the Steller's Sea Eagles follow the pack ice that floats down from Siberia to northeastern Hokkaido, Japan. That is where I shot this image, on a cold and snowy morning. What looks like just snow is actually snow-covered pack ice on the ocean.